Capdase outs Maxx 50 and Maxx 100 super slim powerbanks with DUAL-USB port. You can just slide it in your pockets! See our detailed REVIEW here. In this modern age, we are counting on to our daily driver to get our productivity going. Smartphones and other devices transcend from a mere call-and-text devices to essential tools which contribute in completing our daily tasks. These devices are manufactured with juicy battery but we all know that our mobile activities hastily drain our packs. So we tend to get a powerbank. Heavy users, as we are, rely to this source of power, especially when we are on the go. Capdase is also one of the rising players in this space. It's current offering, the Capdase Maxx 50 and Maxx 100 Powerbanks have 5000 mAh and 10000 mAh capacities, respectively. In this highly saturated market, where would the Capdase Maxx 50 and Maxx 100 powerbank fit? Stay with us after the fold and find out. Capdase Maxx Powerbank, What's in the Box? The Capdase Maxx 100 and Maxx 50 feature a well-built packaging. If you have opened a Capdase Pulse or T-Bass before, you'll see the familiar glossy paper and plastic aesthetics. But, we're not here to talk about the box. Flipping the covers exposes the Capdase Maxx powerbank nestled in a plastic bed alongside the micro USB cable. There's also the powerbank's manual out of the box to guide you in using the device. 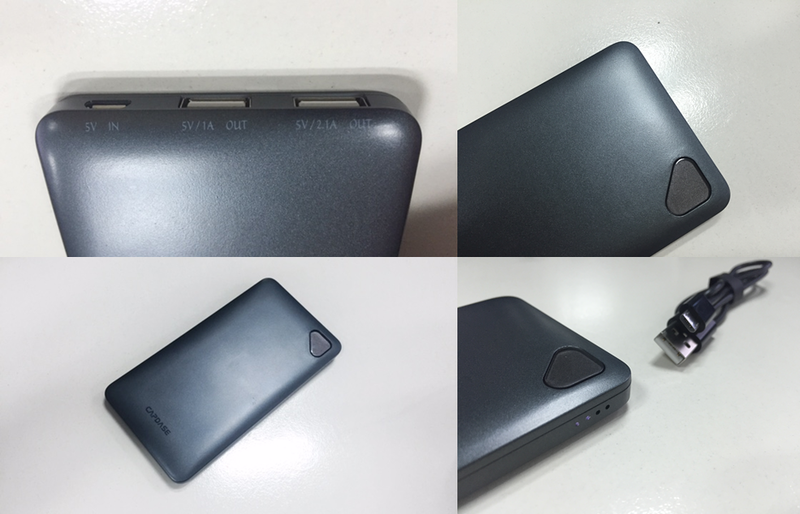 Unlike other metal-clad powerbanks, the Capdase Maxx comes with a smooth plastic shell. This makes it easier to slide in the pocket in contrast to other edgy designs like the Xiaomi Mi Powerbank or the Asus ZenPower. There's a striking similarity between the Capdase Maxx Powerbank and a Casio Scientific calculator in terms of material used. You will also notice that Capdase has taken the "slim approach" in dealing with powerbank's portability. The Maxx 50 is 12-millimeter thin while the Maxx 100 is a tad thicker at 15mm. The drawback of a slimmer profile is the wider body. Both 5000 mAh and 10000 mAh Maxx have 136 x 72 mm surface measurements(length x width). On top view, the device's panel houses the power level button on the upper right side of the device. It's a triangular button with filleted edges; across the bottom is the Capdase branding. The right lateral side is the home to the power level indicator while the top side has the main ports. Unlike any other powerbanks offered in the market, the 5000 mAh Maxx variant features a 2.1A output. This means that you can charge an iPad or any kind of device that requires at least 2.1A input current rating. This also means that you can charge faster compared to the usual 1.5A current output. It is also worth noting that the Capdase Maxx Powerbanks have built-in over-charge and over-temperature protection to secure both the powerbank and your devices. I could get two and a half charging sessions using my iPhone 6 (1810 mAh battery) which is pretty impressive considering that the Maxx 50 have 5000 mAh capacity. 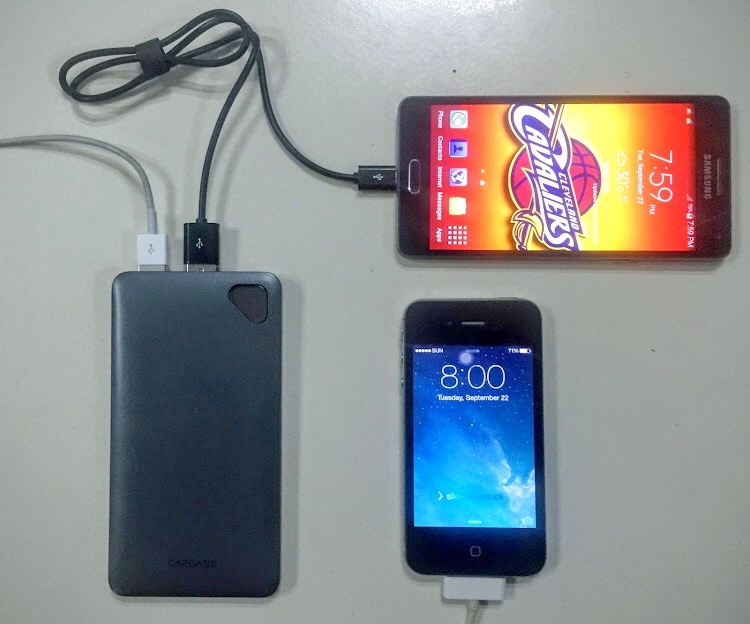 If I am to be technical, Capdase Maxx 50 charging efficiency could hit the 92 to 95 percent range. Charging the powerbank is fast it only took me more or less 3 hours of charging time to hit "fully charged" in the battery level indicator. The input is rated at 5 volts with 1A current. Of course, it has also another port with 1A current output. Talking about packs with at least 5000 mAh rating, the Capdase Maxx 50 and Maxx 100 are the lightest and the most portable powerbanks I have tried. This series’ selling point is the dual-USB port and the capability to offer 2.1A output current. These justify its higher selling price.